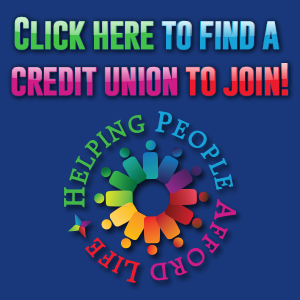 ATLANTA – Georgia’s credit unions capped off 2016 with a strong fourth quarter to close out another solid year, wherein the number of total loans grew by 3.2 percent in the final quarter (12.6 percent annualized). 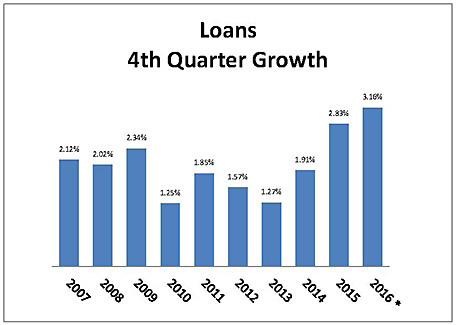 Trending as they did throughout the year, all categories of loans experienced positive growth in the fourth quarter. Credit cards led the way in the last quarter of the year, growing by 5.3 percent (21.2 percent annualized). 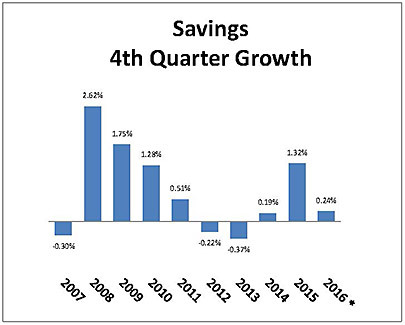 Second mortgages grew 4.9 percent during the quarter (19.6 percent annualized) and first mortgages recorded a 4.2 percent (16.8 percent annualized) gain. Meanwhile, business loans were up 3.5 percent (14.2 percent annualized), used vehicle loans increased 2.3 percent during the quarter (9.4 percent annualized), new vehicle loans were up 2.2 percent (8.7 percent annualized) and other types of unsecured loans rounded out the fourth quarter with growth of 1.7 percent (6.6 percent annualized). Georgia’s unemployment rate has fluctuated a bit, but continues to be low, closing out the fourth quarter with rate of 5.4 percent. Fewer Georgia credit union borrowers are filing for bankruptcy, with a 2.3 percent decrease from a year ago. To read the full release, which includes graphics and a video, click here.